In the last decades a substantial knowledge about sleep mechanisms has been accumulated. However, the function of sleep still remains elusive. The difficulty with unraveling sleep’s function may arise from the lack of understanding of how the multitude of processes associated with waking and sleep—from gene expression and single neuron activity to the whole brain dynamics and behavior—functionally and mechanistically relate to each other. 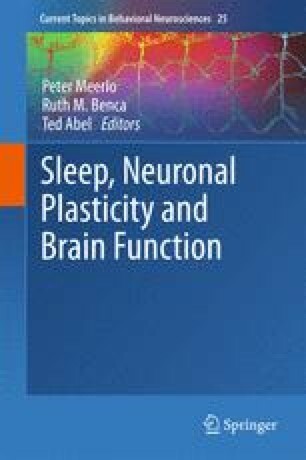 Therefore, novel conceptual frameworks, which integrate and take into account the variety of phenomena occurring during waking and sleep at different levels, will likely lead to advances in our understanding of the function of sleep, above and beyond what merely descriptive or correlative approaches can provide. One such framework, the synaptic homeostasis hypothesis, focuses on wake- and sleep-dependent changes in synaptic strength. The core claim of this hypothesis is that learning and experience during wakefulness are associated with a net increase in synaptic strength. In turn, the proposed function of sleep is to provide synaptic renormalization, which has important implications with respect to energy needs, intracranial space, metabolic supplies, and, importantly, enables further plastic changes. In this article we review the empirical evidence for this hypothesis, which was obtained at several levels—from gene expression and cellular excitability to structural synaptic modifications and behavioral outcomes. We conclude that although the mechanisms behind the proposed role of sleep in synaptic homeostasis are undoubtedly complex, this conceptual framework offers a unique opportunity to provide mechanistic and functional explanation for many previously disparate observations, and define future research strategies. We would like to thank Drs Giulio Tononi and Chiara Cirelli for their valuable comments on the manuscript.